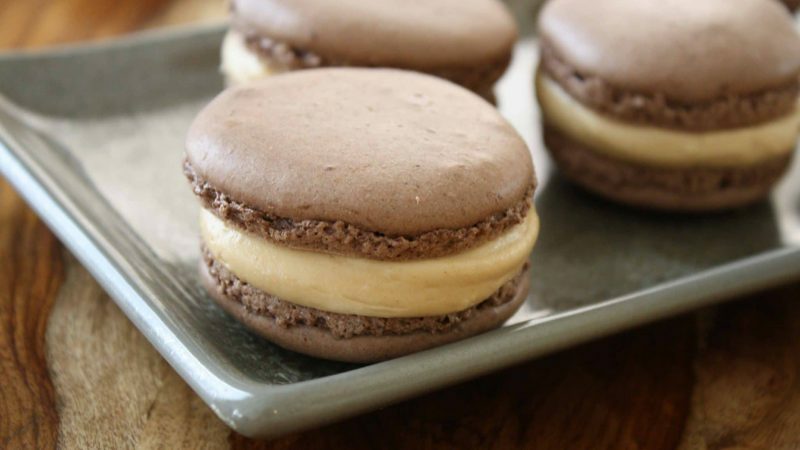 These French inspired delights are decadently layered with a mouthwatering peanut butter filling. You will never again be tempted to indulge in a plain old peanut butter cup after sampling these! Line two baking sheets with parchment paper and have a pastry bag with a plain ½ inch tip ready, (we used a zip lock style baggie and cut ¼ inch of the corner off which made a ½ inch opening). In a food processor, grind together the powdered sugar with the almond flour and cocoa so there are no lumps, about 10 one second pulses. In the bowl of a standing electric mixer, beat the egg whites until they begin to rise and hold their shape. While whipping, beat in the granulated sugar until very stiff and firm, about 2 minutes. Carefully fold the dry ingredients, in two batches, into the beaten egg whites with a flexible rubber spatula. When the mixture is just smooth and there are no streaks of egg white. Spoon the batter into the pastry bag (or baggie). You may need two batches. Pipe the batter onto the baking sheets in 1 to 1 ½ inch circles, spaced evenly one inch apart. Rap the baking sheet a few times firmly on your counter top to flatten the macarons, and then bake them for 15 to 18 minutes. Let cool completely, then remove from the baking sheets. Cream all ingredients to a smooth consistency. Spread the filling on the bottom side of one cookie, then top with the bottom side of another cookie facing the filling to make a sandwich. Use as much filling as you desire, we used about 2 teaspoons per cookie. To enhance the flavors, let the macarons stand for a day before serving. Store in an airtight container for up to 5 days or freeze. If you do freeze them, defrost in the unopened container to avoid condensation which will make the macarons soggy.